Thanks to the National Fisheries Institute for sponsoring this post. 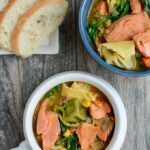 This Instant Pot Salmon Tortellini Soup recipe is simple, healthy and so easy to make for dinner. It uses ingredients from your freezer so its perfect for a night when you need a last minute meal. 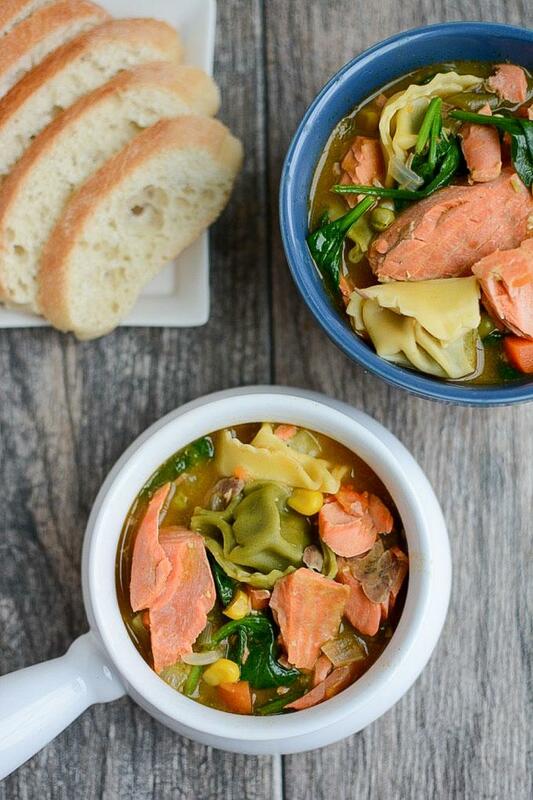 I am so excited to share this Instant Pot Salmon Tortellini Soup recipe with you guys. It’s so so so easy and absolutely delicious. And it’s the perfect way to add some more seafood to your diet. For the third year now, I’m partnering with my friends over at the National Fisheries Institute to share some easy seafood recipes like this Grilled Foil Packet Tilapia with Pesto Veggies, this Sheet Pan Italian Salmon with Green Beans and these Shrimp Curry Noodle Bowls. A few years ago, they launched a seafood education initiative called Dish on Fish to help educate Americans about the importance of eating seafood and to encourage seafood consumption so be sure to follow them if you’re looking for easy ways to eat more seafood! You can find them on Pinterest, Twitter and Facebook. The timing of this recipe is no coincidence! Did you know February is National Heart Month? That means it’s the perfect time to start eating more seafood, which is great for your heart! In fact, according to the U.S. Dietary Guidelines for Americans, Americans should be eating 2-3 servings of seafood each week. Fatty fish like salmon, sardines and tuna are full of omega-3 fatty acids which are good for your heart and low in saturated fat. They may help reduce inflammation, lower blood pressure and reduce the risk of heart disease. So whip up a batch of this soup and dig in! This soup, as I mentioned, really could not be easier. I used a bunch of stuff that I always have stocked in my freezer, like salmon, tortellini (I love Giovanni Rana) and mixed veggies, and you don’t even have to thaw them first! That means its perfect for those nights when you’ve got nothing in the fridge and nothing on the menu! 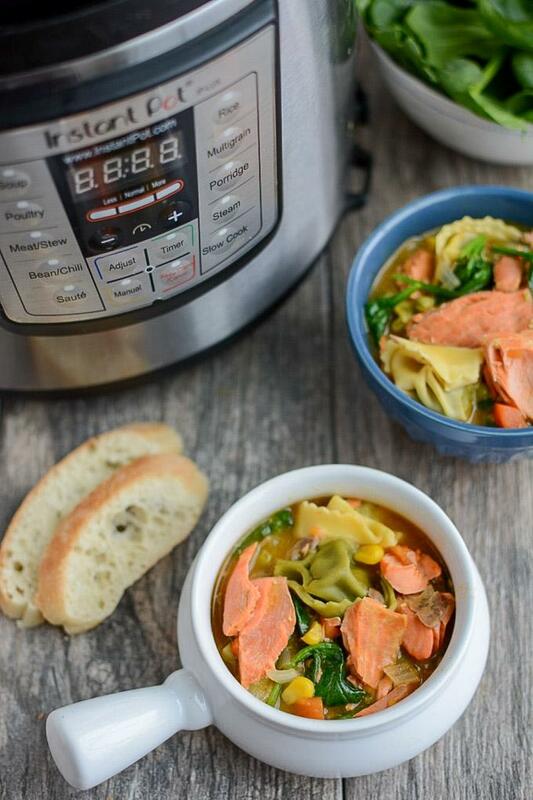 This Instant Pot Salmon Tortellini Soup is a quick, healthy dinner recipe that uses staple items from your freezer to make a heart-healthy meal. Set the Instant Pot to saute and add chopped bacon, onions and garlic to the pot. Saute for 3 minutes, stirring constantly. Switch Instant Pot off. Add frozen salmon (cut into 3-4 pieces if not already portioned), frozen vegetables, frozen tortellini, broth and seasonings to the pot and stir. Cover and use the manual (or pressure cook) button to set timer for 6 minutes. Use quick release once finished, flake salmon into chunks with a fork and stir in fresh baby spinach. You can use salmon with the skin on, just pull the pieces of salmon out after cooking, remove the skin, flake into chunks and return to the pot. You could probably do this with fresh salmon and tortellini but I would cut the cooking time in half and I haven’t tried it myself. This is a sponsored conversation written by me on behalf of Dish on Fish . The opinions and text are all mine. Yum! I haven’t tried salmon in my IP yet! This looks like a great way to start! yes! definitely worth a try! I love the simplicity of this! And that you used salmon in SOUP! yay! it’s a fun way to change things up! Looks great!! Want to try it this weekend but how do you think it would taste without the bacon? i think it would be fine. Bacon adds flavor but you could add some Old Bay or another of your favorite spices to increase the flavor! What a great recipe idea! I ‘ve never thought to put salmon in soup! Just finished making this! It’s amazing!